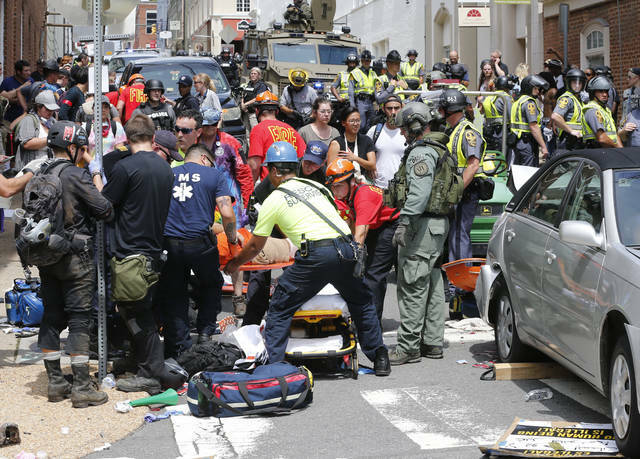 Rescue personnel help injured people after a car ran into a large group of protesters after a white nationalist rally Saturday in Charlottesville, Va. The nationalists were holding the rally to protest plans by the city of Charlottesville to remove a statue of Confederate Gen. Robert E. Lee. There were several hundred protesters marching in a long line when the car drove into a group of them. CHARLOTTESVILLE, Va. — The driver of a car accused of crashing into a crowd protesting a white supremacist rally in Virginia had been photographed hours earlier carrying the emblem of one of the hate groups that organized the “take America back” campaign. Meanwhile, the mayor of Charlottesville and political leaders of all political stripes vowed to combat the hate groups and urged President Donald Trump to forcefully denounce the organizations that had promoted the protest against the removal of a Confederate statue. Some of those groups specifically cited Trump’s election after a campaign of racially charged rhetoric as validation for their beliefs. Police charged James Alex Fields Jr. with second-degree murder and other counts after a silver Dodge Challenger they say he was driving barreled through a crowd of counter-protesters, killing a woman and wounding at least 19. In a photo taken by the New York Daily News, Fields, a 20-year-old who recently moved to Ohio from Kentucky, stands with a handful of men, all dressed similarly in the Vanguard America uniform of khakis and white polo shirts. The men hold white shields with a black-and-white logo of two axes. The Confederate statue of Robert E. Lee is in the background. The Daily News said the photo was taken about 10:30 a.m.
Charlottesville officials say Fields crashed his car into the crowd at 1:42 p.m. The Anti-Defamation League says the group believes the U.S. is an exclusively white nation, and uses propaganda to recruit young white men online and on college campuses. The two sides quickly clashed, with hundreds of people throwing punches, hurling water bottles and unleashing chemical sprays. Some came prepared for a fight, with body armor and helmets. Videos that ricocheted around the world on social media showed people beating each other with sticks and shields. Amid the violence, the Dodge Challenger tore through the crowd. The impact hurled people into the air and blew off their shoes. Heather Heyer, 32, was killed as she crossed the street. “It was a wave of people flying at me,” said Sam Becker, 24, sitting in the emergency room to be treated for leg and hand injuries. Those left standing scattered, screaming and running for safety. Video caught the car reversing, hitting more people, its windshield splintered from the collision and bumper dragging on the pavement. Medics carried the injured, bloodied and crying, away as a police tank rolled down the street. Virginia’s governor declared a state of emergency, police in riot gear ordered people out of the streets, and helicopters circled overhead, including one that later crashed, killing two state police troopers. Officials had not provided a crowd estimate but it appeared to number well over a thousand. Fields’ mother, Samantha Bloom, told The Associated Press on Saturday night that she knew her son was attending a rally in Virginia but didn’t know it was a white supremacist rally. “I thought it had something to do with Trump. Trump’s not a white supremacist,” said Bloom. Associated Press writers Alan Suderman in Richmond, Virginia, Heidi Brown in Charlottesville, Claire Galofaro in Louisville, Kentucky, and John Seewer in Maumee, Ohio, contributed to this report.